The Club Meeting of July 18, 2003. This page shows photographs from the July 18, 2003 club meeting. This month we invited John Kirchhoff, shown above, to give us a “goodies show.” John works for Rider’s Hobby Shop of Livonia Michigan. 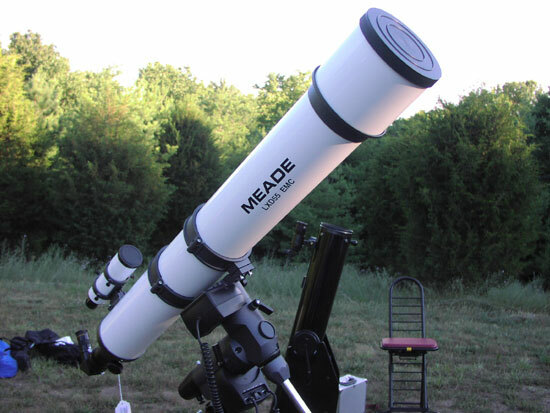 John brought a number of “goodies” including this Meade telescope. 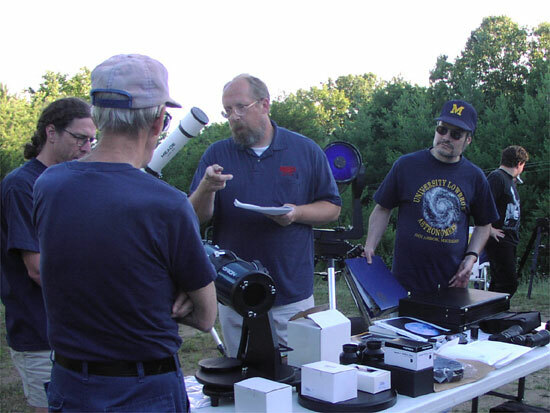 Before the meeting started several club members look at some of the items John brought, including this Orion tabletop telescope. President Charlie Nielsen brought the meeting to order. A number of business items were discussed. When the business items were over, John started his “goodies show.” He showed us some assorted Celestron binoculars that ranged from 10x50’s to a 25x100. 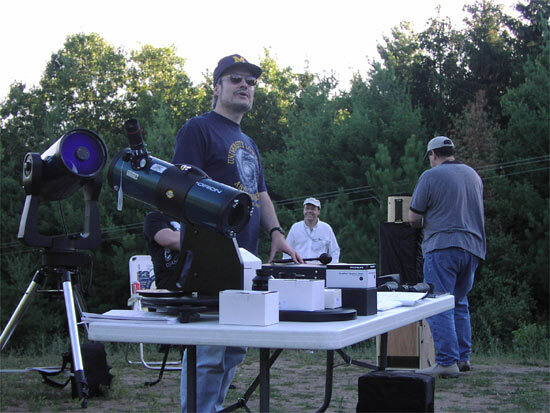 He also had three telescopes, a Meade LXD55 EMC (f/9 refractor, on John’s left) a Mead LX200 GPS (10 inch reflector, partly obscured, behind John) and a Orion Starblast Altazimuth Reflecting Tabletop Telescope (4 1/2”, f/4, on John’s right). 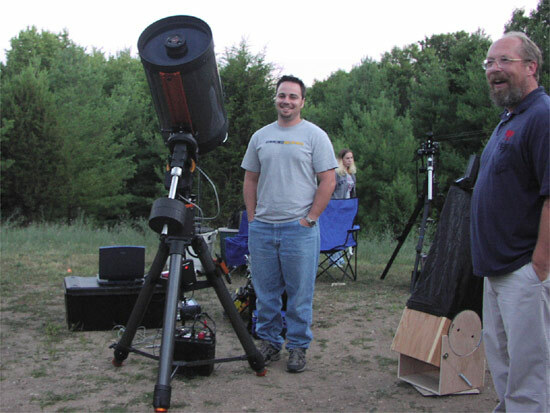 The Celestron C14 telescope (behind the Orion telescope) was brought by one of John’s customers. There were assorted eyepieces (including a Televue 41mm Panoptic), a spanish language planisphere, some astronomy books, an observing plate for Meade telescopes, a focus kit for Meade telescopes and some filters. 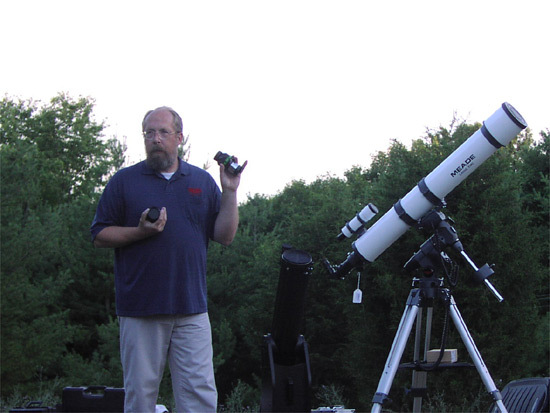 Here John is showing the club two of the eyepieces he brought. 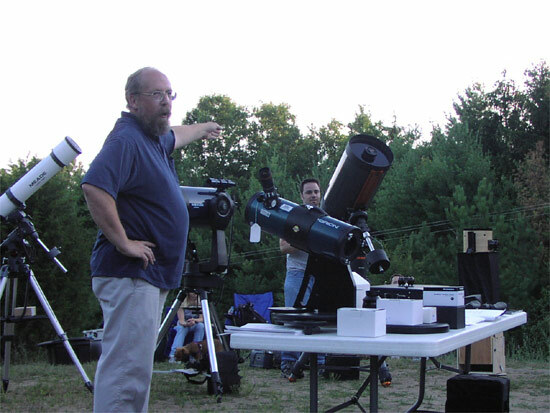 With the exception of the telescopes, each item was passed around for club members to look at. 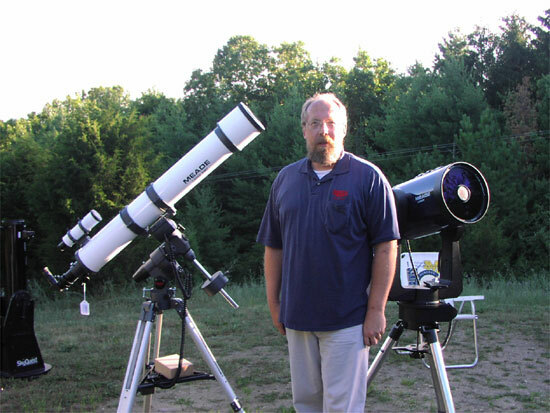 Michael Fisher (one of John’s customers) brought his own personal Celestron C14 for the club to look at. Michael is in the center, and John is on the right. At this point the meeting adjourned, and club members proceeded to look at some of the toys John had brought. A few club members had brought their own telescopes. As it got dark, people looked through the telescopes. It was quite clear and there was less sky glow in the south than usual. Club members who stayed saw an Iridium flare, and around 12:30 or so Mars was just high enough to be seen above the tree line. (John had said he needed to leave at midnight, but was kind enough to let us continue using the telescopes). A few telescopes were pointed at Mars allowing some comparisons between scopes. More photographs from club meetings. All the photographs on this page were taken during the club meeting on July 18, 2003. All photos were taken by Dave Snyder.